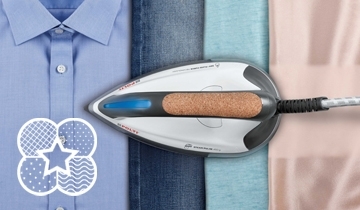 La Vaporella is the new Made in Italy iron to iron in a simple and fast way. 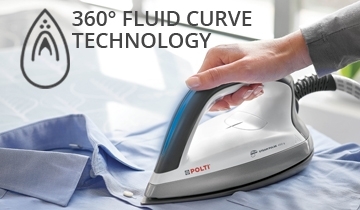 You can iron perfectly any type of fabric, thanks to the 4 preset programs that intelligently combine steam and temperature, and the exclusive Universal function. 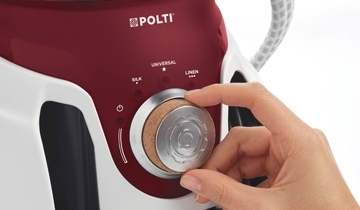 The 7 BAR powerful boiler with unlimited working autonomy and the 15 BAR pump let you iron better and in less time. The innovative soleplate with patented 360 ° FLUID CURVE TECHNOLOGY, rounded and multidirectional, will eliminate even the most difficult creases without effort..
To guarantee maximum reliability for a long time, La Vaporella has a powerful boiler guaranteed for 10 years with the exclusive NO CALC LONG LIFE BOILER TECHNOLOGY that prevents the negative effects of limescale, giving your boiler a longer life without any need of maintenance. 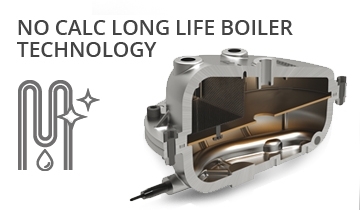 Boiler with innovative NO CALC LONGLIFE TECHNOLOGY that prevents the negative effects of limescale for a longer life without maintenance. The particular aluminum alloy neutralizes the effects of tap water impurities, while its special internal design - scale catching device and anti scale filter - catches even the smallest limescale particles and protects the active boiler components. As a result, no boiler maintenance is needed. Only with La Vaporella is the boiler guaranteed for 10 years against any damage caused by limescale * To iron without worries, for a long time. *This additional warranty is valid only if the product is registered within 30 days of its purchase, and with a receipt. Perfect results at the first pass with the innovative multi-directional rounded aluminum soleplate with double ceramic coating. 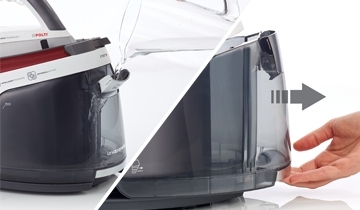 The great precision tip reaches even the most difficult areas and easily smoothes even the most stubborn creases thanks to the concentration of steam, while the uniform distribution steam channels allow faster ironing for professional results in a very short time. The rounded edges for 360° ironing allow perfect smoothness without effort, easily navigating obstacles such as buttons, collars, pockets. What will you iron today? Linen, silk or cotton, whatever you need to iron, with the four preset programs it will be childs' play! La Vaporella is an intelligent iron that, according to the selected program, establishes the right combination of temperature and steam power, for professional results without effort. In addition, for heavier and more difficult fabrics La Vaporella has Turbo: the special program will allow you to eliminate even the most resistant creases thanks to the powerful steam of the high pressure boiler. 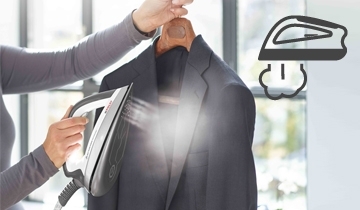 Select the Universal program and iron anything you choose without worries: no more waiting, forget about the adjustment time and temperature and the worries about ruining fabrics. From jeans to wool, from linen to silk, the iron will always be ready to iron perfectly without effort. 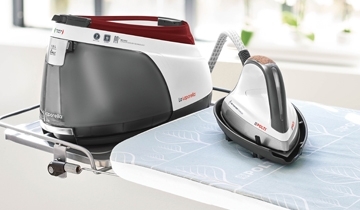 If you have to face long ironing sessions or if you want to freshen up curtains and coats with vertical ironing, activate the STEAM PULSE function: just double click on the iron button and the steam will automatically be emitted at regular intervals, without pressing the steam button continuously. 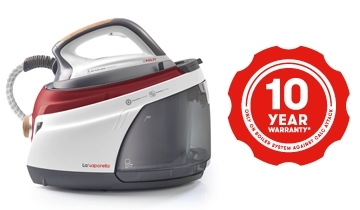 With La Vaporella the steam is unlimited: the capacious 1.5 litre removable tank allows you a long autonomy for ironing sessions without interruptions. 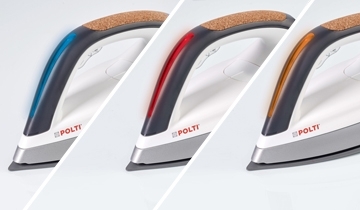 The red LED on the iron will warn you when it's time to refill the tank again: you can fill it directly through the flap on the front of the tank or under running tap water. Wherever you go the iron can follow you: place the iron where you are most comfortable with the removable iron pad. Equipped with non-slip rubbers you can place it on the ironing board to have the iron always at your fingertips, for maximum comfort.